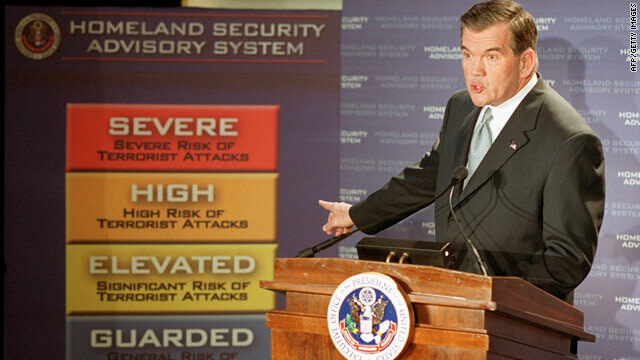 Former Homeland Security Secretary Tom Ridge points to a new color-coded threat advisory system in March of 2002. Washington (CNN) -- Despite the "palpable level of angst" that a source described over an al Qaeda threat against the United States, the national terror threat level remains at "Elevated" or "Yellow" -- where it has been stuck since 2005. Information gathered since an attempted airliner bombing on Christmas Day has U.S. officials concerned that al Qaeda in Yemen has "trained and equipped ... viable operatives" to strike U.S. targets, including targets unrelated to aviation, a reliable source familiar with the investigation told CNN. The threat level for the aviation sector didn't change after the Christmas Day incident -- it has been at "High" or "Orange" since 2006 when British officials uncovered a plot to use liquid explosives to bring down Transatlantic flights. A security expert calls the current color-coded system "useless." "It's ineffective as communicating to the American public. And it's obsolete in terms of kind of managing national preparedness levels," said James Carafano, a homeland security expert at the conservative Heritage Foundation. "It really is useless." The system -- officially known as the Homeland Security Advisory System -- was implemented in March 2002 -- just months after the September 11 terrorist attacks on New York and Washington. The terror alert system is most recognizable by a color coded graphic, which includes: Severe (red), High (orange), Elevated (yellow), Guarded (blue) and Low (green). "The Color-coded Threat Level System is used to communicate with public safety officials and the public at-large through a threat-based, color-coded system so that protective measures can be implemented to reduce the likelihood or impact of an attack," according to the DHS Web site. Carafano argues that the general public simply does not understand the color system and how it impacts them, which "actually undermines the credibility of it." He pointed to announcements and terror alert signs at the nation's airports as one example of the public tuning out. "So for example, when you go through the airport and they say 'the alert level is orange' nobody even hears that. It's just noise in the background. It might as well be music. And it's meaningless." Frank Cilluffo, associate vice president of the Homeland Security Policy Institute at George Washington University, said that in order for the system to be effective, specific and concrete actions need to be given. "It is simply too broad and vague," he said. "Moreover it clearly suffers from public cynicism and indifference, and its ability to communicate to and serve the general public and American citizen has been woefully inadequate." Homeland Security Secretary Janet Napolitano, at a Reuters Washington Summit in mid-October, acknowledged problems with the advisory system. "The problem is a color code, or a number, or whatever, without information to people as to what it means, and what they're supposed to do, that's really where the frustration is," Napolitano said at the summit. "The code itself, absent a connection with real information, doesn't have much utility." In July, Napolitano commissioned a bipartisan task force to examine the HSAS system. The task force discovered that, for one, there is "indifference" to the HSAS and "at worst, there is a disturbing lack of public confidence in the system. In our judgment, this lack of public confidence must be remedied." The solution, according to the report, is to narrowly target a specific region and sector under the threat, provide more specific information about the threat and give the public actionable steps they can take when a new alert is given. The report also found that the system is "sufficiently clear, powerful and easily understood to be retained as one element in the Secretary's alerts to the nation." Carafano, who was on the task force, said they were divided on whether to scrap it all together. The recommendations were sent to Napolitano, who indicated that she would pass along the results to other Cabinet members and officials at the White House. A senior DHS official told CNN Thursday that the secretary's review process is still taking place. Cilluffo said, though, that more needs to be done to make sure the threat alert for air security matches up with national security. "There needs to have more precision in the system. Should there be credible intelligence, other sectors [besides aviation] or the national threat level could also be raised." But Cilluffo said that while the system is in need of a "significant tune up," there is some merit in having a threat warning and advisory system. "The Homeland Security Advisory System serves various audiences, notably state and local first preventers and first responders, numerous private sector entities and the American citizen and general public," he said. "These are the stakeholders who should drive changes to improve the system to meet their objectives." According to the DHS, the threat level has been modified 16 times. The alert system for the country has nearly remained at "yellow" and "orange" since its inception and has never been lowered to "green" or "blue," according to DHS. It was, however, elevated to "red" once -- August 10, 2006 -- on commercial flights originating from Great Britain and headed to the United States. That incident resulted in tough restrictions on liquids being carried on board a plane. That threat came years after the thwarted terrorist attack on board American Airlines Flight 63 in December 2001. In that case, Richard Reid tried to light explosives hidden in his shoes. He was later subdued and the threat was over. Reid is in prison after being convicted in a federal court. The terror alert system, however, was not in effect at the time, but rather, implemented in 2002. The incident did create new airport security procedures, namely travelers having to take off shoes during screening and further restrictions in what can and cannot be brought on board. But the recent failed Christmas Day terrorist attack on board a Northwest Airlines flight to Detroit, Michigan, raises new questions on whether security has improved, considering the suspect in that case tried to ignite a liquid explosive hidden in his underwear. While the incident gripped the country, the national threat level remained unchanged at "Elevated." The threat level for domestic and international flights, however, remains at "High." Some argue that the whole system should be scrapped. Carafano said it's unlikely, mainly for political reasons. "The odds that the administration doing something now are nil because I think they'd be afraid to scrap the system and that the people would just say 'oh you don't care about homeland security anymore because you're getting rid of the alert system.'" Carafano added that if they were to raise the threat level, critics would accuse the administration of hyping up the threat; and if it isn't raised, it would be accused of being indifferent. That criticism was aimed at President Bush during the 2004 presidential election. Just days before the nation voted, Osama bin Laden released a videotape, which led to an emergency meeting among senior members of the Bush administration. The terror level was subsequently raised. Democrats accused Bush of politicizing terrorism in order to get re-elected. The president denied the charges. Critics pointed out that bin Laden has since released videotapes with no real effect on the threat level. Former Homeland Security Secretary Tom Ridge in his book, "The Test of Our Times," writes that an "election-eve drama was being played out at the highest levels of our government" after bin Laden released a pre-election message critical of Bush. Then-Attorney General John Ashcroft and Secretary of Defense Donald Rumsfeld strongly advocated raising the security threat level to "orange," even though Ridge believed a threatening message "should not be the sole reason to elevate the threat level." The alert was eventually raised. Ridge later backed away from the assertion in the book, saying he wasn't questioning his colleagues' motives and that the passage could have been clearer. "And I'm kind of musing and scratching my head, and I've got two people whose opinions I respect immensely, I'm not second guessing them, but I just say in the book, "Is it politics?" Perhaps the sentence should have been in a paragraph later -- we wouldn't be having a conversation," he told CNN. On November 10 -- eight days after Bush's re-election victory -- DHS downgraded the "orange" alert back to "yellow." CNN's homeland security correspondent Jeanne Meserve contributed to this report.